The Saudi-led coalition is battling the Iran-aligned Houthi movement which controls most of northern Yemen. Southern Yemeni separatists took control of the port city of Aden after two days of fighting, residents said on Tuesday, confining the internationally-recognised government of President Abd-Rabbu Mansour Hadi to the presidential palace. Fighting between southern separatists allied to the United Arab Emirates (UAE) and forces loyal to the Saudi-based president Hadi risk crippling their once united campaign against the Iran-aligned Houthi movement in Yemen’s north. Residents said forces loyal to the Southern Transitional Council (STC), formed last year to push for the revival of the former independent state of South Yemen, seized the last stronghold of its Presidential Protection forces rival in Dar Saad area in northern Aden in battles that at times involved heavy artillery and tank fire. Activists shared photos on social media of the Southern Yemeni flag flying over the base’s gate. The STC is backed by the UAE, a main component of the Saudi-led coalition. Residents said STC fighters from the Southern Resistance Forces had earlier overrun Presidential Protection forces outposts in central Aden’s Crater and Tawahi districts. An International Committee of the Red Cross (ICRC) official said more than 36 people had been killed in the fighting. Separatists stopped outside the al-Maasheeq palace, where Prime Minister Ahmed bin Daghr’s government is based, residents said. The Saudi-led coalition, which intervened in Yemen’s civil war in 2015 to restore Hadi’s government after the Houthis forced him into exile, called in a statement on Tuesday on both parties to cease hostilities. “The coalition will take all the measures it deems necessary to restore stability and security in Aden,” it said. The fighting began on Sunday after a deadline set last week by the STC for Hadi to dismiss bin Daghr’s government, accusing it of corruption and mismanagement, expired. The government denies the allegation. Witnesses said hundreds of people danced and sang as they celebrated the STC victory with fireworks that lit the night skies over Aden. 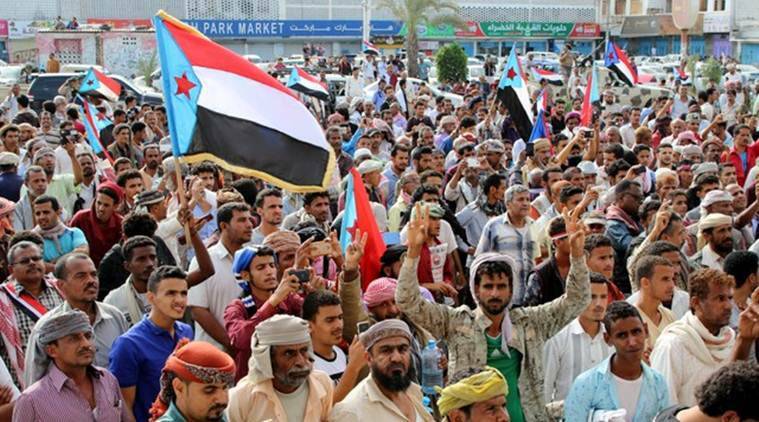 The crowd chanted slogans demanding restoration of the southern state that merged with North Yemen in 1990.